At Peaceful Fields Sanctuary, we currently provide 48 animals with forever homes. Each animal has a unique and very special personality, and we enjoy spending time with each of them. As we continue to grow, you can find bios of new sanctuary residents below! Sweet Brownie was abandoned in a field with horses and then rescued by a foster family. PFS provided him a forever home in July of 2014. He’s very timid and shy from his past experiences, but is otherwise a healthy four year old boy. He loves to be hand fed his treats and have his rump scratched! Elvis came to us in December 2014 from a severe abuse and neglect prosecution in Montgomery County, Maryland. Several horses were seized, all in poor health, and one was so far gone he could not be saved. 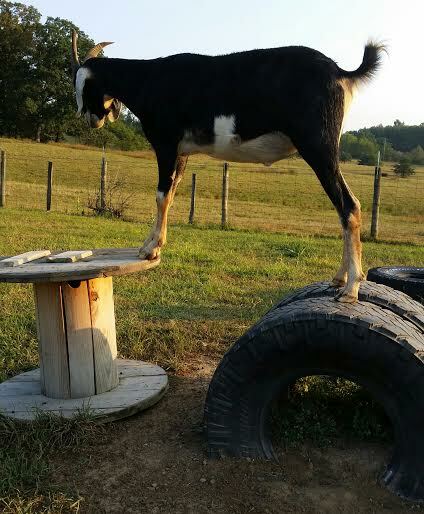 Elvis was nursed back to health at Paradise Stables in Maryland and is doing well here at PFS. He shares a barn with Brownie and they act just like brothers. Sweet Pea is a four year old female pygmy goat. She came to the sanctuary together with her partner in crime, Buster. She is very talkative, really friendly and is amazing at jumping and fitting through small spaces! Buster Buster was an unwanted male from the dairy goat industry. He moved here along with Sweet Pea in October of 2014 and is also about four years old. This Nubian has long legs, making him an expert jumper. He loves tree leaves and will stand up to pull down the branches! Toby In June of 2015 Toby came to the sanctuary at just one week old and still nursing. He’s from Chesapeake,Va where he severely injured a leg and received no medical treatment for days. He was surrendered to PFS to prevent him being euthanized. Dana and Bailey stayed up all night to transport him safely to us. After a partial leg amputation and hard work to stabilize his condition, he was taken to Virginia Tech for further surgery. The remainder of his leg was removed at the shoulder and he also received a blood transfusion. So many people generously donated to cover his medical costs and now he scampers and plays as any kid! In August of 2015, this sweet female goat was rescued. She had been abandoned on a condemned property here in Winchester and was in pretty bad shape. She had steadily improved and was treated for internal and external parasites. She fits in well with her new friends and is very sweet. Frank and Eddie came all the way from Farm Sanctuary in New York. These twin boys needed permanent placement and the sanctuary was happy to take them. They are about five years old and are a very comical duo! Suswa and Nala were private surrenders to Peaceful Fields. Suswa “Susie” is gently and wears wooly pants as the stylish lady of the goat barn. Nala lives with the pygmies and she is a favorite with many visitors who form a special connection with her. These three lovable pygmies are siblings and were a private surrender to the sanctuary. Walter has a goatee and a high pitched voice like a pony. Warren is the resident Oreo cookie who loves hugs and Paula is a cuddlebug with blue eyes who loves to give kisses (and sometimes nibbles). As of October 2017, we have 40 chicken residents at PFS. It is difficult to make a profile for each of them, but we assure you they are all very unique individuals and we love every one of them! 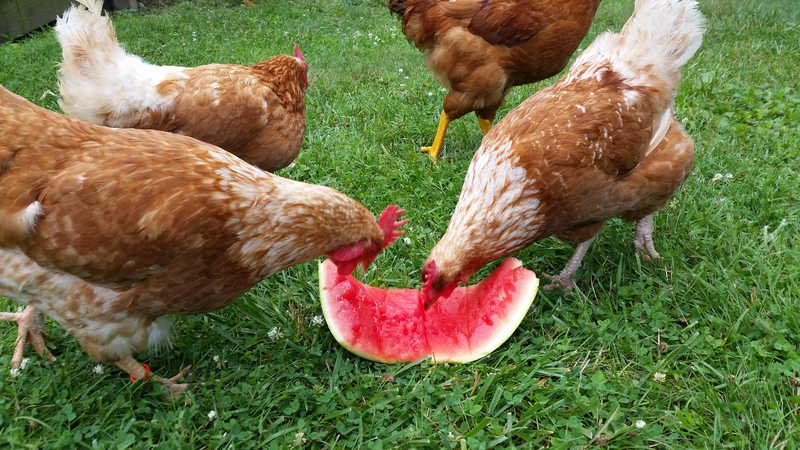 Some of the chicken residents are: Cluck Norris, Chewbacca, Dora, Ruby, Lucy, Dennis, Buffy, Randy, Biff, Chuck, Beatrice, Xena, Marilyn, Dolly, Petula, Patsy, Thelma, Louise, Jack, Pepper, Coco and Syd. Last Spring, Martha was found tied to a tree in the middle of the woods in Louisa County, Virginia. She was 90 pounds underweight, extremely sick and had eaten everything within reach down to the dirt when she was discovered. Right after arriving at the sanctuary, she gave birth to a lamb, pictured above! They are both doing very well- Martha has been spending her time with both Elvis and Brownie, but is soon getting a house of her own! Her baby is currently enjoying his days playing with the goats and has such a unique personality. Koporos Chickens These six Cornish chickens made their way to PFS from New York, where they were exploited per pre-Yom Kippur ritual, where chickens are taken by either their wings or legs and swung overhead, as it is believed that doing so will symbolically transfer those sins of that person to the chicken. Here at the sanctuary, the chickens look forward to living a life in peace, away from any abuse and suffering. They are currently adapting to a new life here and we look forward to watching them grow! Beauty came to PFS from West Virginia where she was used on a dairy farm. While there, she developed a hoof infection that went untreated and progressed to the point she had difficulty walking. At some point she fell and permanently damaged the nervous system controlling her front legs. As a result she could no longer stand, walk or feel pain. In this condition she was still being bred until rescued. She spends the days now basking in the sun next to the pygmy goats and looking for tasty leaves. She values her independence and has a very sweet, expressive face. On November 28, 2017, PFS became home to Matilda, a goat who had lost her other companions and after being among them for so long, she became lonely and needed a forever home with other friendly goats! Matilda is getting used to life here at the sanctuary and has made friends with many of the others! She gets really playful and enjoys relaxing in the sun. Ellie is the Sanctuary’s very first pig rescue! She was abandoned in the Hampton Roads area of Virginia, underweight and with scabies. She made her way to PFS and called the Sanctuary home on March 26th, 2018. Here you can see Ellie in her very own area with her house, plenty of grass and a kiddie pool with water and mud! She is so cute and has such a unique personality. She loves belly rubs, napping in the sun and eating apples, which she enjoyed just before this picture! WE ARE GROWING TO MEET THE NEEDS OF SO MANY ANIMALS and NEED YOUR HELP! Please visit our Donate tab and give generously. I’m very touched by your compassion and caring toward these wonderful animals. I hope to visit your sanctuary within the next few months. I’m especially interested in donkeys (like Brownie), but the bios of all your residents have moved me greatly. Will be in touch soon to make an appointment to visit you!